This guide introduces visual literacy and why it is important. It discusses how to think about, use, and create images and visual media, and provides links to important resources. his section discusses digital images; specifically images composed of pixels (primarily photographs). However for the sake of clarity it should be mentioned that there is another category of digital images called vectors. In the remainder of this section, "digital image" is used to refer to images composed of pixels. Digital images are made up of pixels (short for picture elements). Pixels are squares of individual colors. The best way to see this is to magnify a digital image enough to see the pixels. As you can see in the following example, the image is composed of squares (pixels), each of which is a single color. Most digital cameras create images that are in JPEG file format. Most high-end digital cameras also give you the option of creating image files in RAW format. These file types are described below. RAW images are the original, minimally processed images recorded by the camera. RAW files are large but contain all of the original data in the image. Therefore RAW images are preferred when doing image editing, and the end result when shooting in RAW format is likely to be a higher quality image. One disadvantage of RAW is that when you shoot in RAW you will need to use photo editing software that recognizes the RAW format created by your camera. If your photo editor doesn't recognize your RAW files, you probably need to download an update from the website of the photo editing software you are using. The bottom line is that if you are a professional or advanced amateur photographer (or want to be), it is usually best to shoot in RAW format. Otherwise, stick with JPEG format -- you are still going to get some great looking pictures! Note: The above file formats do not support layers. If you want to combine photographs into a collage, the best way is to use a photo editing program such as Photoshop and import JPEG images into separate layers. This results in a mulitple-layer Photoshop (.psd) or TIFF (.tif) file. PSD and TIF are high-quality uncompressed image file formats that support multiple layers. After you finish editing your multi-layered file you can then export it as a JPEG file. In digital photography, the resolution of an image is expressed in pixels per inch (ppi). The higher the resolution of an image, the smaller the pixels are. A general guideline for printing digital images (to achieve high quality pictures suitable for magazines or for framing), a resolution of 300 ppi or more is desirable. For other purposes (posters, newsletters, etc. ), lower resolutions are often acceptible, but anything below 150 ppi is likely to look pixelated, which is usually undesirable. Online display of images is typically at a much lower resolution than print, in the range of 100 ppi and above. However, with the advent of screens such as Apple's "retina" display (264 ppi as of September 2013) that is changing. The important thing to remember about online display of images is that the display resolution is determined by the resolution of the display screen, not the resolution of the image itself. It the resolution of the image is higher than the display, the image will look larger on the screen than in print. 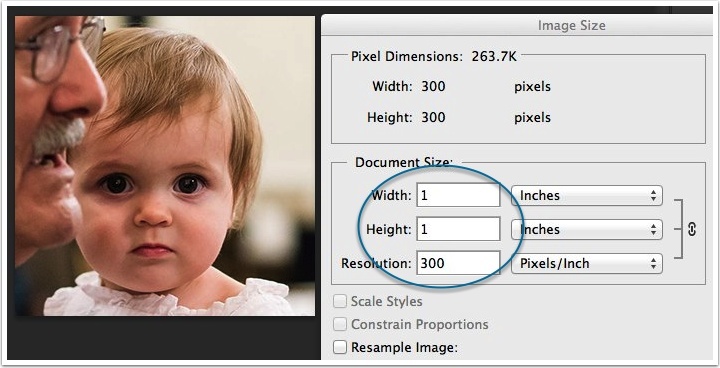 The following example shows an image in Photoshop's Image Size dialog box. The image size in pixels (also called pixel dimensions) of the first image is 300 X 300 pixels, and the resolution is 78 pixels per inch (ppi). Increasing the resolution from 78 ppi to 300 ppi causes the document size (or print size) of the image to decrease from 3.846 inches to 1 inch. But it does not affect the pixel dimensions. Therefore it doesn't affect the size of the display on a computer screen. To change the total number of pixels (i.e., image size or pixel dimensions) you need to resample the image. 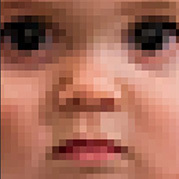 Resampling either increases (upsampling) or decreases (downsampling) the number of of pixels in the image. If you check the Resample Image checkbox, you are then allowed to enter new values for the Width and Height of the image in pixels. Because resampling has reduced the pixel dimensions, the image now looks smaller on the screen. For another example illustrating the relationships between image size, resolution, and print size, watch the video below. The exposure takes place when you press the shutter button on your camera. The exposure determines the amount of light that reaches the film (or sensor) when you take a picture. If a picture is overexposed, it looks too light; if underexposed, it is too dark. To some extent, you can correct for underexposure and overexposure when you process pictures on the computer (or in a darkroom, if you are using film). But it is always best to start with a good exposure. Obviously the amount of light (and its direction) in the environment is a critical factor. Some photographers use flash to add light or use special lens filters (neutral density filters) to decrease the amount of light reaching the film or sensor. * "ISO" stands for International Organization for Standardization. These exposure variables are discussed in the "Exposure Variables" box below. For a given photo, just what is "properly exposed" is somewhat subjective. Photographers may deliberately "underexpose" or "overexpose" to achieve a desired effect. Also the lighting conditions may be such that the best exposure doesn't agree with what the camera's light meter says (see "Exposure Compensation" below). The two above are equivalent exposures – in the second case, the faster shutter speed is made up for by the faster ISO speed. The results may be very different photographically, however. In fact, choosing a good combination of settings is an important skill in making effective photographs. Of course, having a properly exposed picture is important, but doesn't guarantee the photo will be a good photo. Shutter speed is the length of the exposure. The longer the shutter speed, the more light reaches the sensor (or film). If the subject of the picture is moving quickly, you need to use a faster shutter speed if you want to freeze the motion. If you place your camera on a tripod, you can take exposures at night that are minutes or hours long. This is necessary because it is so dark that the pictures would be severely underexposed if you used the much faster shutter speeds you are likely to use during the day. The aperture, or lens opening, refers to the size of the opening of the lens during the exposure. Almost all photographic lenses have variable apertures. The size of the aperture is expressed in "F stops." A wide aperture, such F 1.4 or F 2, lets in more light than a small F stop like F 16 or F 22. Each F-stop lets in twice as much light as the next wider F-stop and half as much as the next smaller F-stop. For example, F 2.8 lets in twice as much light as F 4, but only half as much as F 2.0. "Fast" lenses are lenses that include wide apertures, such as F 1.4. A slower lens might have a maximum aperture of only F 4, for example. Fast lenses are more versatile and they tend to be more expensive than slow lenses. However, that doesn't necessarily mean that the optical quality of a fast lens is better than a slower lens. ISO refers to what, in the days of film, was called "film speed." This is a measure of the sensitivity of film to light. For example, you could shoot a roll of ISO 400 film (in the days of film, a relatively fast speed), or a roll of ISO 100 film (a slower film). In modern digital cameras, you can change the ISO speed from shot to shot if you want to. 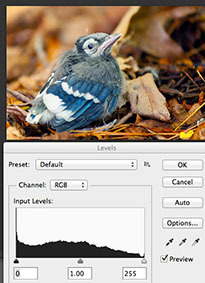 Many digital cameras allow you to view a histogram of the picture you have taken (or are about to take). 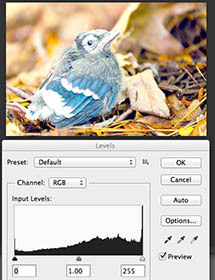 Histograms are also used in image editing software (such as Photoshop, in the example below). Understanding image histograms will help you both when taking photos and when processing them with computer software. 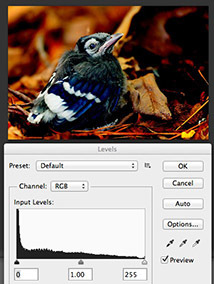 The histogram is a graph that shows the distribution of brightness values of the pixels in the image. The graphs under each image below shows the black and darker shades on the left, and white and brighter values on the right. The midpoint corresponds to middle gray. This is illustrated below. 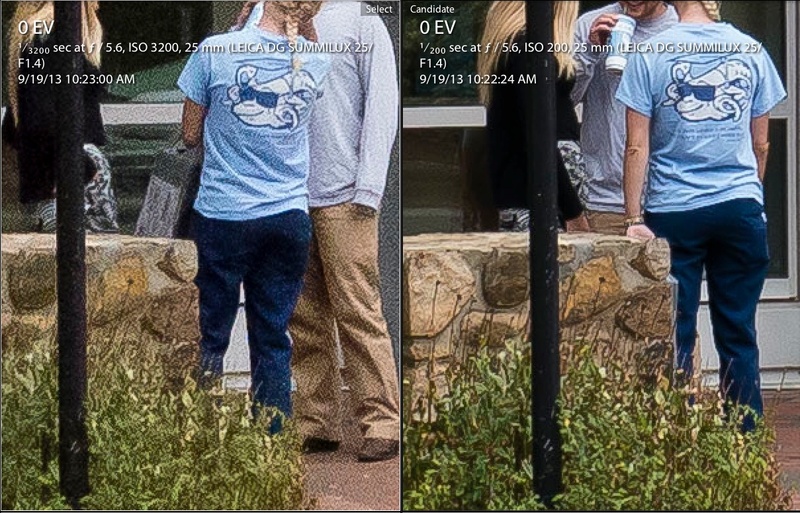 Notice that the histogram corresponding to the overexposed image on the right is skewed to the right. 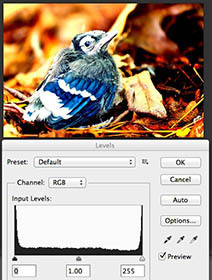 In image editing applications such as Photoshop, you can adjust the distribution of pixels in the histogram by dragging the handles that appear at the bottom of the histogram. This is a good way to change the brightness and/or contrast of the image. For more information about image editing, see HSL's Introduction to Photoshop guide. In some situations, especially with a backlit subject, the "correct" exposure as determined by the camera's light meter is not ideal. In the following example, the light coming through the window caused the light meter to determine an exposure that was about right for the trees in the background, but too dark for the woman who is the subject of this picture. By setting exposure compensation on the camera (in this case to just over 1 1/2 F stops), the exposure is much better for the subject. Of course who or what is the main subject is up to the discretion of the photographer. In some cases the photographer may want to expose for the background and make the subject a silhouette. Focal length refers to the angle of view provided by a lens. Wide-angle lenses provide a wide angle of view, whereas telephoto lenses provide a magnified or narrow angle of view. The visual effect of a focal length is affected by the size of the sensor (or film size) used by the camera. 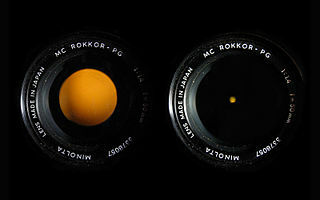 Due to the popularity of the 35mm film standard, focal lengths of lenses are often described in terms of "35mm equivalents" (see Digital Cameras and Sensors below). Wide-angle lenses are considered to be 35mm and below; "normal" lenses are around 40mm to 60mm, short telephoto around 85mm to 135mm and long telephoto 150mm and over (35mm equivalents). * Micro four-thirds (MFT) is a mirrorless interchangeable lens camera (MILC) format. See Digital Cameras and Sensors below. Depth of field refers to the range of distance that is in focus. For example, a picture could have a depth of field of four inches between 2' and 2' 4" away from the camera (technically, from the focal plane, or position of sensor or film). 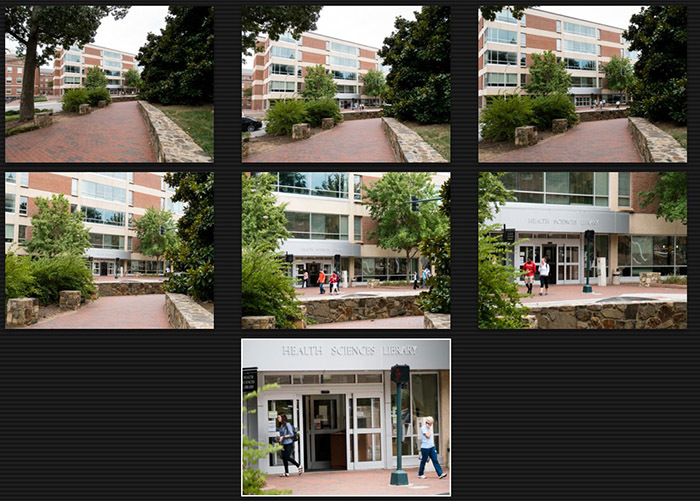 Depth of field varies depending on the distance, focal length of the lens, and the aperture. 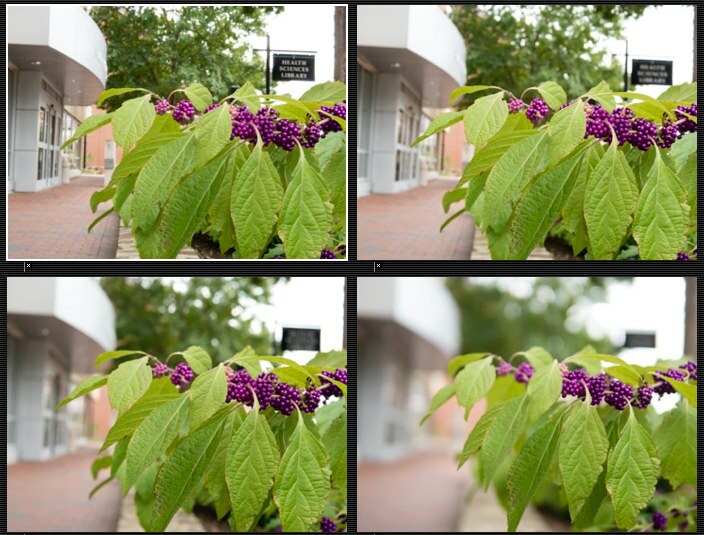 A good way to illustrate depth of field is with examples of multiple exposures of the same composition, taken with the same lens and focal length but with different apertures. 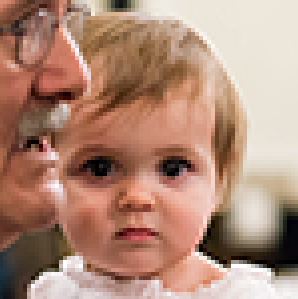 As you can see the photo taken at the largest aperture (F 1.4) has the smallest depth of field. A small depth of field helps isolate the subject, which may be desirable. In other cases (often in landscape photography, for example), you may choose to use a large depth of field so that much of the picture will be in focus. The heart of the digital camera is the sensor, which captures light during the exposure and turns it into a photograph. 1. Sensor size affects the angle of view of lenses. A smaller size results in a narrower angle (more telephoto). So, for example, a 50mm lens on a 4/3" sensor camera is equivalent to 100mm on a 35mm (or "full frame" camera). 2. Larger sensors can potentially capture more information (measured in megapixels), and may capture higher quality images. The downside of using a larger sensor is that this requires that the camera and lenses be bigger to accomodate the larger sensor. Full-frame digital single lens reflex (DSLR) cameras are high-end, sophisticated cameras. "Full frame" means that the sensor is the same size as a negative frame from a 35mm film camera. "Single lens reflex" refers to a mirror mechanism that allows you to look through an optical viewfinder that shows you exactly what the sensor sees. Full-frame DSLRs use interchangeable lenses. DSLRs are used by professionals and are the most expensive of the popular cameras. Crop-sensor DSLRs are similar to full-frame DSLRs, but have somewhat smaller sensors. They are often very high-quality cameras, but usually below top-of-the-line full-frame cameras. Crop-sensor DSLRs often can use many of the same lenses used by full-frame cameras made by the same company. Mirrorless Interchangeable Lens Cameras (MILCs) include many of the features of high-end DSLRs, but are lighter and more portable. They use electonic viewfinders (EVFs) instead of the optical viewfinders found in DSLRs. Their sensors are somewhat smaller than in full-frame DSLRs, but large enough to yield high-quality photographs (some MILC sensors are as large as crop-frame DSLRs). MILCs are substantially more expensive than point and shoots but usually less than DSLRs. Note: There are also a few mirrorless cameras with sensor sizes comparable to MILCs that have fixed lenses (not interchangeable). Point and shoot cameras and cell phones have small sensors. They are inexpensive, very portable, but have the fewest features and the lowest image quality. Many point and shoot cameras don't have a viewfinder; instead you must use the screen on the back of the camera.